AFFORDABLE JOB-SEARCH GUIDANCE TOTALLY IN THE SPANISH LANGUAGE! 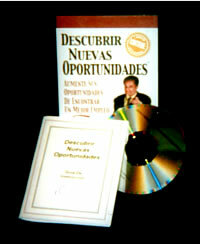 Descubrir Nuevas Oportunidades is an audio-based tutorial containing a 50 - Minute Audio CD and a 50 - Page Action/Success Guide (handbook). It is a self-directed, home-study course on successful job-search methods and techniques for those who learn best in the Spanish language. • Self-assessment to determine career direction. • Resume writing to generate interviews. • Researching for job opportunities. • Job hunting telephone techniques. • Interviewing techniques to land the best offer. • Negotiating compensation for the best salary and benefits. The entire program (Audio and Guide) is in the Spanish language. And – the price allows every Spanish speaking employee to have a copy!